Donat Agosti: Is Copyright undermining Biodiversity Research and Conservation? in springtime, I invited Dr. Donat Agosti, research associate at the American Museum of Natural History and one of the founders of the famous antbase.org website to give a lecture at the University of Ulm. A few weeks later he arrived in Ulm and after his talk and an evening with discussions on ants I took the opportunity for an interview. We talked about the "renaissance of taxonomy", the future of systematics in the World Wide Web, copyright problems arising from free data transfer and the use of internet databases for species conservation and nature protection. Martin: There has been a long time in which taxonomy and museums have been thought to represent an old and outworn part of science, that has been outwit by modern biotechnology. Now taxonomy is about to come back. Why? Is it because of the internet? Donat: Why does it come back? I think because of connectivity we might say. Because of new tools we now have for the first time the chance to make all our data accessible. We have new tools like automontage, visualisation tools, which allow you to show images of animals, which is extremely important because we are just visual animals ourselves and there is an increasing amount of electronic data out there which can be mined. And the new generation of students, they rely very much on the Internet. If we have a huge amount of data accessible people will use it. Martin: Do you think there will be a time when data on every animal and every plant is available on the internet? Donat: I think probably not every, but I think there is a chance that a huge amount of data will be available. I think the chances are increasing the more we add to the system; because the more we add, the more interest we generate, and the more likely will get additional funding. Martin: And what’s about the ants in this system? They are an important taxonomic group, how much have been done for their presentation in the internet? Donat: Well, ants they are one of the first large groups with over 10,000 species who had an online catalogue, so all the species names and their older names can be found online and are continually updated. And now most of the literature, I would say 98% is online, so you essentially can go from a species name to an original-description. There is an increasing amount of imagery out there like in antbase.net or antweb.org, and more is added almost daily. Ants are thus ideal for a large digital library project which aims to provide better access to the printed records by making text recognition and developing an XML-based standard to mark up the logic content of the publications allowing advanced “googeling” tools to search those publications which can be linked to the former datasets. But there are also efforts now that we try to build complete data sets. I mean, the idea is to provide products which are well defined, so we want to say: “well, we have all ants”. So the goal is that somebody can go and build up a trust in a system of which he is pretty sure that all the information is given and correct. So he doesn’t have to go to do more research around but he has like one entry into the world of ants, that is the point to their entire systematics. So we try to develop products to cover all the ants, but also to give all information to particular regional groups of ants. For example we want to develop a portal for all the information on ants of Madagascar. That includes all the images, descriptions, names, distribution-data and so on. And once we have that I think the value of all is that accessibility can easily be demonstrated. At that point conservationists and geneticist will realise the potential of those knowledge-systems. Martin: Do you think this efforts will have also an impact on species conservation and nature protection? Donat: Yes, I think this is very important, I think that they realize this in the conservation world. There is a realisation that one has to go back to species data. I mean, for example, hot spots are defined by endemic species. So one has to go and find what species there are. Unfortunately conservationists are not yet including all species like invertebrates, so they probably built up the hot spots on 5% of the existing species but they also show now an interest to expand the set of species, like they want to include ants and they want to include dragonflies knowledge and other data into the assessment of hot spots. But also we realise that we have to come up with monitoring systems to show whether the efforts we make bear fruits. That means we have to be able not only to come up with things like lists or bench marks but you have also be able to monitor this. And in this 2010 program where the goal is not to loose, to reduce the rate of loss worldwide of species or to stem loss of species in Europe, we will have to be able to demonstrate that we don’t loose anything. This essentially means that we have to go back to specimen data and say ok: “Here is what we had before and now that is we have”. Martin: So, monitoring species diversity and species losses is essential for biological conservation? Donat: We need a monitoring and we also need the basis to do so and that is where systematics comes in. 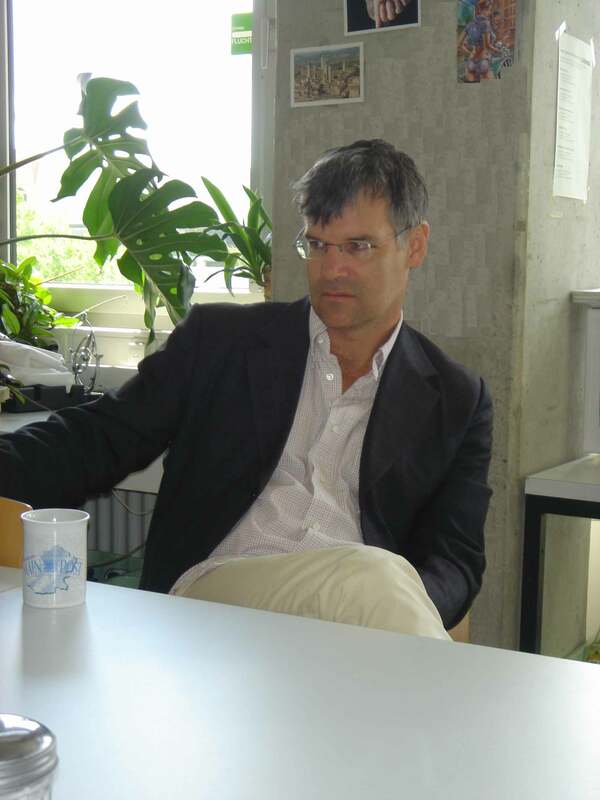 Martin: As you have mentioned in your talk (held at the University of Ulm, 7.6.2005), you had a lot of problems with the copyright of the taxonomic descriptions when you started your project to make all taxonomic data on ants accessible via internet. Donat: Well, there’s a paradox in that, that we now have essentially the internet and we have more and more online publications, so a lot of the species descriptions or biological journals that are essential for biology they are online. But there is a problem that the access to this information is extremely costly in especially the commercial journals and some of the larger databases who generate money for their activities. They have a very stern copyright, so they essentially say you are not allowed to use this information or this PDF somewhere else. Though we could now disseminate these information very easily, we can’t. Martin: Should we pay for information, or should everything be free…? For example, in the fine arts Microsoft and other companies have built up large internet picture galleries by photographing paintings and artworks from museums of old masters and modern art, and in the end they want money for this job. Is this a model for science and for museums of natural history? Donat: Well, one is in a different shape in the commercial world and in science and in environment and in education, because in our world, we definitely don’t have big revenues by a scientific data base. Because we operate differently, because we essentially are paid up from to get grants from science foundation, then we have to develop a data base or research results. And once you did this, it is out and you only get the next grant if you deliver those results. So, essentially, we are not interested to trade a product and then get revenues afterwards, that’s one basic thing. Martin: Do you really get enough money for you project (e.g., antbase.org) or wouldn't it be better to get some private investors who will earn revenues later by selling the biodiversity information? Donat: I think there is no private agency who is interested in that. There is not the market big enough to do so. And also I think the importance is that we essentially all are operating on a shoestring, if you look it from a global budget if it is even a few million dollars or so that we get for systematics and conservation. It’s a very low amount of money and I think since we don’t have the resources to built up like monitoring systems or to do conservation properly or even science comprehensively we better share our data and try to make the best of the situation . If you share data we have synergisms because we get more data together and we essentially can address more questions we couldn’t do of our own. In that prospect it’s very important that we connect all the data and built up large datasets. Martin:…on a free basis ? Donat: Yes, "free" doesn’t have to mean it has to be free for everybody. So if a commercial entity wants to use the data you can always add a close like Science Commons to us, who says: it’s open access on the conditions of that so we can use for science or for conservation, but if you want to use it for commercialisation …. then you have to come up and negotiate your contract. So you are not allowed to use it for commercial. Martin: So, do you think that information about taxonomy is not interesting for the market ? Donat: There are definitely segments that are of interest, like guide books for example, field guides. But I look at that from a point that… guide books, they always exist and they are very important and I think there should be a market for them. But the information in guide books, like description of the species and even equal are the images, they should be freely accessible. But not the guide book per se. So, if you are interested to a guide book on Botswana, or so, then you should be able to go to internet and retrieve data. And make a nice guide book and take money for the guide book but not for the data per se…..
Martin: Do you think that there will be a kind of consciousness about biodiversity, due to all the information in the internet? That the people are more aware of the value of biodiversity, if they can surf through the 10.000 ant specimens that will be available on the web some day? Donat: I would answer that yes. Because if you have a web site like we have in antbase.org there is one model called the ant lifecycle and that was the most visited and you also get lot of, I mean, a record feedback, I would say, from schools. Because they go and look at this and they like it because they see that. And then you can go in and you can see different mating systems. And you can go back essentially to the original literature or you can go back and see ok what ants do the same things, so you can connect that. So essentially it allows an interested student to go back into more and more depth. And essentially to go back down to the original source. And essentially he can go read about that or he can get bibliographic records if they are online and he can go back and using that to go to library. Or he can see images of these ants, he can see distributions and find out that actually in your backyard, if you care, you can see images of that. And I think that is one area where people get more aware of the interested. But in your part, I think there is a different world, because the more data we have accessible for conservatories, the more it will be used and the more we actually can give data to the activist or go out and especially supply people in a developing world, it’s like data they never had before to go out. I talk here about like our specimen data for example the Dinoponera lucida in Brazil which is a very tall ant, very obvious to see, very easily, walking around for us, but its only restricted a few fragments left. So essentially, we have a management plan, there are awareness campaigns out. So you can actually use this specimen data in conservation issues. But there is like our own specimen data but you can also be linked now through the Conservation Commons, which is an initiative to make a lot of environment data accessible, so that you can actually get also environmental data. So o.k., I get the ant here in Brazil and you can also get a satellite image of the area, which is very striking, because you can see actually where this point is and then you know where the ant lives - it is a small forest fragment it is just out in cultivated fields. And that’s an important thing, because if you are a little bit computer “safy”, an NGO in Brazil, you can take that and essentially can go print the things and you can say “….look here is the problem, you can’t do anything to this forest fragment, because it’s the last one. So we should not do that…” . That in itself helps to close the gap between the industry who normally has much better systems and information than you have. Donat: Yes, I mean that’s the idea, it’s open and we disseminate it, so people please use it! Because the more people use it, the better for us. Martin: Ok, Donat. Thank you very much for the interview. © 2005. Martin Pfeiffer. University of Ulm.